His early life was hard by any standards. At 14 he ran away to join the Royal Navy and ‘signed on’ for 12 years. On his 15th Birthday he was sent, with 2000 other boys, to the notorious HMS Ganges training establishment at Shotley Point where a harsh regime held sway. He had the misfortune to be placed under the care of two particularly brutal and drunken instructors whose continual bullying and abuse proved too much for this emerging free spirit, . Realizing his mistake he fought back and with no way out he had no choice but to ‘work his ticket‘. He deserted on numerous occasions and willfully disobeyed orders . Among his many punishments, he suffered ‘cuts’, a particularly brutal form of Naval punishment. The next six years passed with regular naval detentions, ( Royal Naval Detention Quarters RNDQ’s Portsmouth) exhausting punishments, solitary confinements, ending with a twelve month sentence in the infamous HMP Corradino, Malta. He was subsequently dismissed from the service and returned to civilian life. 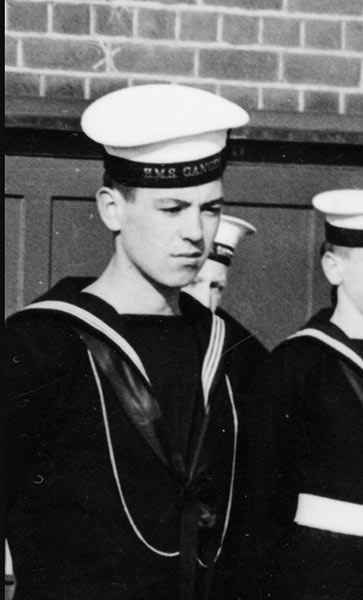 Like lots of other boys I ran away from home when I was 14 yrs old and joined the Royal Navy as a Boy Seaman 2nd class. 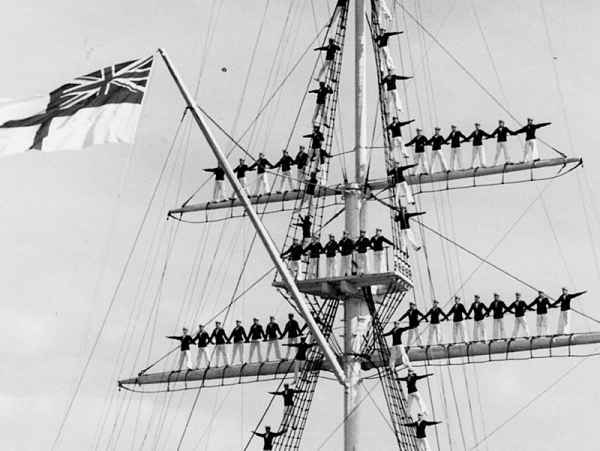 I was sent to the training Ship HMS Ganges a cruel harsh 12 months lay ahead of me and thousands of other boy’s. One lad, a Geordie, was drafted early to a Destroyer bound for the Mediterraniann sailed from Plymouth… He was washed overboard on his first few hours at sea……..His parents never knew of the misery he suffered at Ganges. I wrote this song a long time ago.